In the cosmology of the Hopi—a Native American tribe based in Arizona, USA—a Kachina is a spirit that serves as an intermediary between the natural and spiritual worlds. 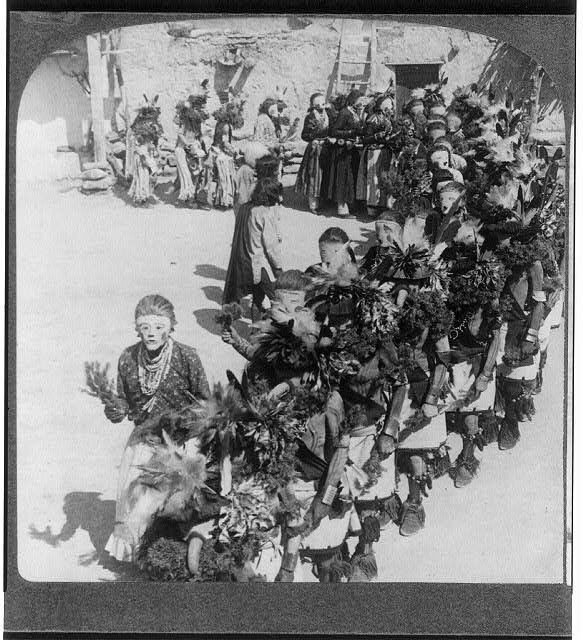 Kachina are said to visit the Hopi pueblos at certain times of the year to interact with the people and bestow blessings, including rain and agricultural fertility. In return, they receive gifts such as prayer feathers and corn pollen. In all, there are more than 450 Kachina recognized in the Hopi pantheon. They embody ancestral spirits as well as elements of nature, from plants and animals to aspects of the weather. Donning costumes, body paint, and masks, male members of the community enact the presence of these Kachina through ritual dances. Leather masks, painted and decorated before every dance to represent a specific Kachina, are often scraped clean afterward. 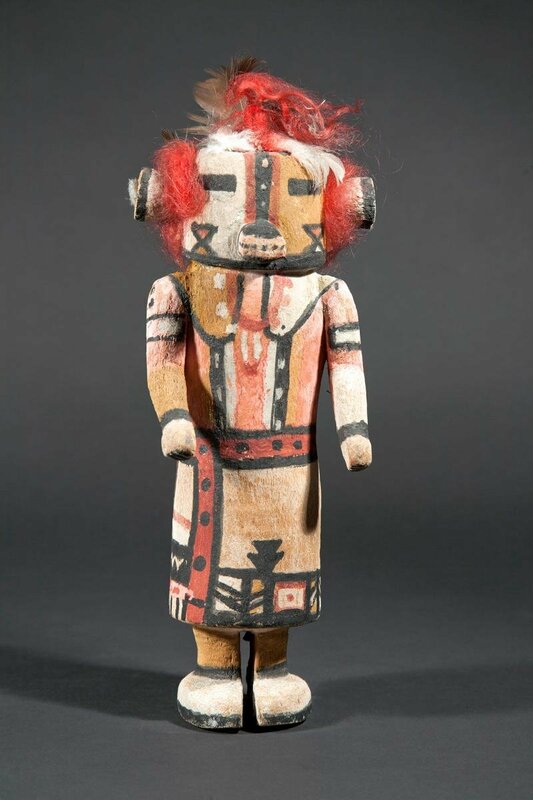 Traditionally, the same dancers make Kachina dolls—also called tithu by the Hopi—to give to young females of the tribe, often members of their own families. Carved from the root of the cottonwood tree and decorated to resemble specific Kachina, the tithu are hung by a string from the rafters of a dwelling to serve as a reminder of the spiritual forces that shape the Hopi world. The doll pictured in this article is by Wilson Tawaquaptewa (1871-1960), one of the few Hopi sculptors to have been identified by name. Tawaquaptewa was from Oraibi, Third Mesa, Arizona; the largest and most prominent Hopi village. He became village chief and priest and, in this capacity, had an important role in the Kachina rituals. Beginning in the 1920s, Tawaquaptewa made Kachina dolls and other carvings for the tourists who, attracted by affordable rail travel and the beauty of Native American crafts, were coming to the Southwest in ever greater numbers. 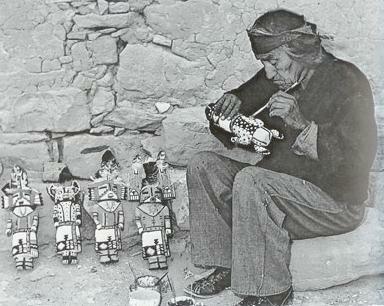 The dolls provided a significant source of income for the Hopi people. But while Tawaquaptewa made his using traditional Hopi materials and techniques, he never reproduced an actual Kachina figure on those pieces that he intended for sale, as this would have run contrary to Hopi values. Instead, Tawaquaptewa combined traditional patterns with elements of his own invention to create unique works of art. The doll featured here displays several key characteristics of Tawaquaptewa’s highly graphic style. It is brightly colored, with rich ochres and faded but evident browns. The sections of the costume—in particular the sash around the waist, an important element of the Kachina dancer’s garb—are divided by thick black lines. But while traditional Kachina sashes have geometric patterns representing elements such as mountains or rain clouds, Tawaquaptewa decorated this sash with his signature dots. 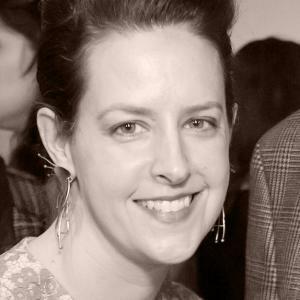 In this way, he was able to evoke the Hopis’ traditions without betraying their secrets; providing for his tribe even as he expressed his own artistic vision.